This project allows you to deploy a JAX-WS endpoint as a Spring Service Bean. We won't repeat the information that is on the site already and instead focus on how to get more out of the Spring integration in the following sections. 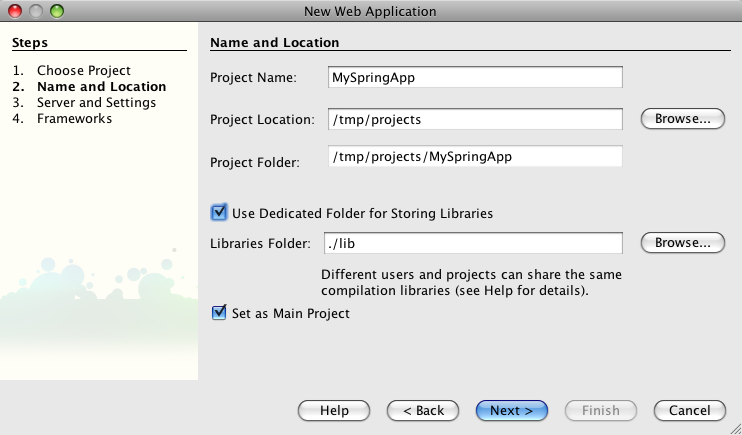 NetBeans provides Spring support out of the box. You just need to make sure you have the NetBeans plugins installed (Spring Framework Library, Spring Beans and Spring Web MVC). 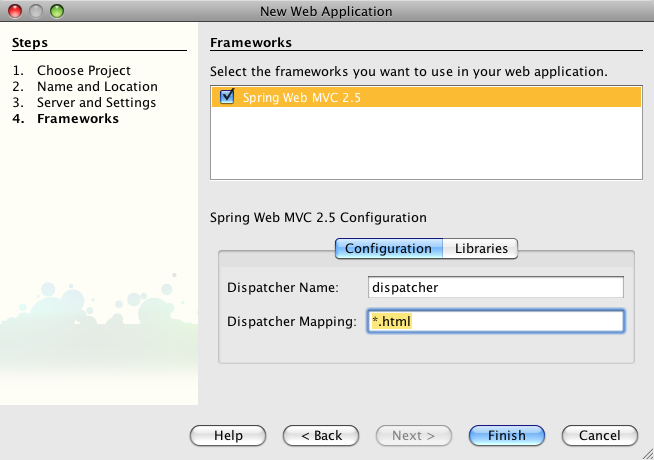 The following section explains how to create a JAX-WS endpoint with a Spring Web MVC application. The instructions assume NetBeans 6.1 but should work with NetBeans 6.0 as well. Now we still need to add the JAX-WS Spring library to the project. You can download the library from http://maven2-repository.java.net/source/browse/maven2-repository/trunk/www/repository/org/jvnet/jax-ws-commons/spring/jaxws-spring/. 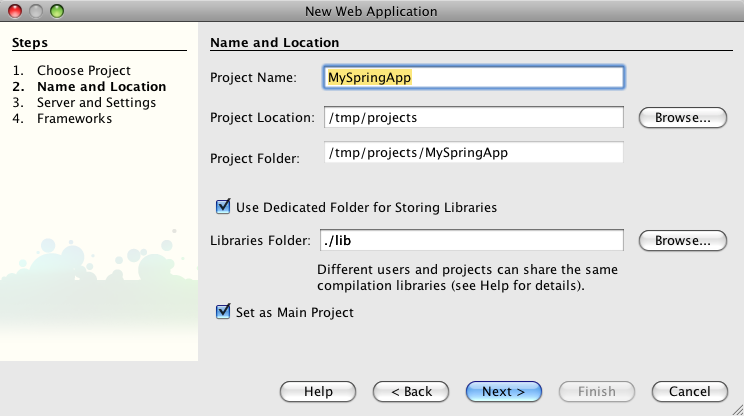 Then move the library (in my case jaxws-spring-1.8.jar) into the lib directory of the NetBeans project. Next, right-click on the project in the NetBeans navigator and select Properties. In the Properties dialog, select the Libraries category and press the Add JAR/Folder button. Here you can select the library and add it to the project. The JAX-WS Spring library has a dependency on XBean. That means we need an additional library. I downloaded this version. Remember to add this library to the project as well. All that NetBeans really does when you create the Web Service is generate a skeleton class with the WebService annotation. You can now add methods to that class etc. At this point we could actually package and deploy our application to GlassFish and we would get a working Web Service because GlassFish recognizes the WebService annotation and automatically instantiates the Web Service. However, we want to use Spring of course, so we need to go through a few additional steps to instantiate the Web Service as a Spring Bean. 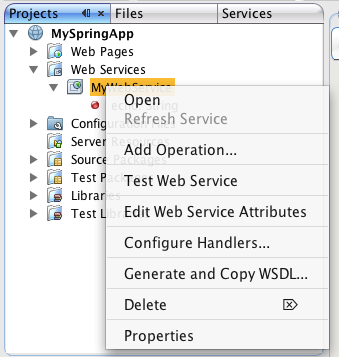 The WSSpringServlet plugs JAX-WS into Spring. The servlet-mapping is mapping the servlet to the subpath /ws. If you built and deployed your web application to GlassFish, you should be able to see a human-readable entry page if you point your browser at http://localhost:8080/MySpringApp/ws. 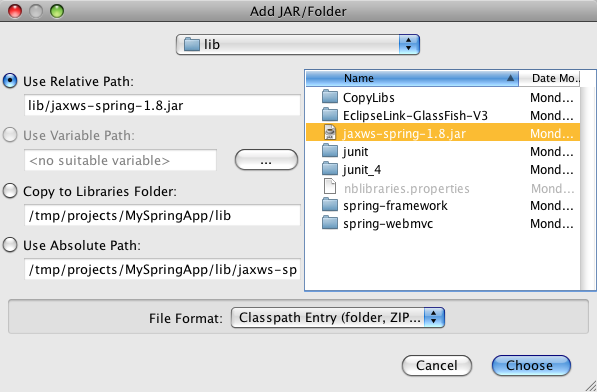 You can find more details on how to configure JAX-WS for Spring here. 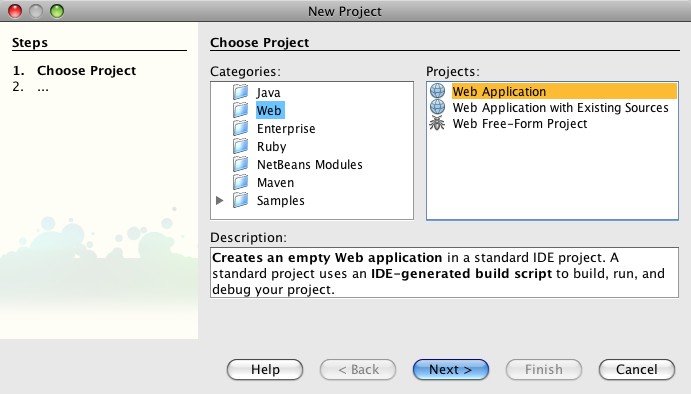 If you downloaded NetBeans with the Web & Java EE pack it already comes equipped with everything you need to develop Spring web applications. Otherwise make sure that you have the NetBeans plugins installed (Spring Framework Library, Spring Beans and Spring Web MVC). 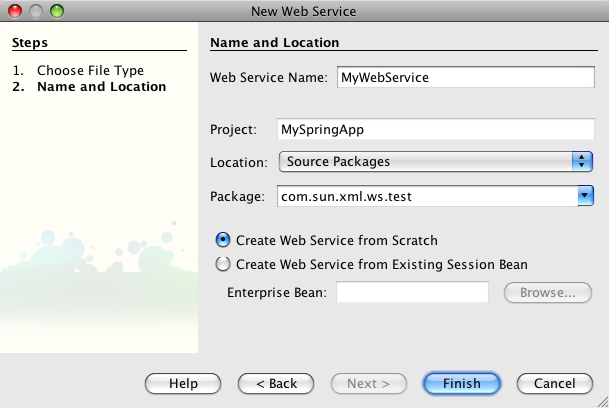 The following section explains how to create a JAX-WS endpoint with a Spring Web MVC application. The instructions assume NetBeans 6.5. See Using Metro With Spring and NetBeans 6.1 for instructions for NetBeans 6.1. Now you still need to add the JAX-WS Spring library to the project. You can download the library from http://maven2-repository.java.net/source/browse/maven2-repository/trunk/www/repository/org/jvnet/jax-ws-commons/spring/jaxws-spring/. Then move the library (i.e. 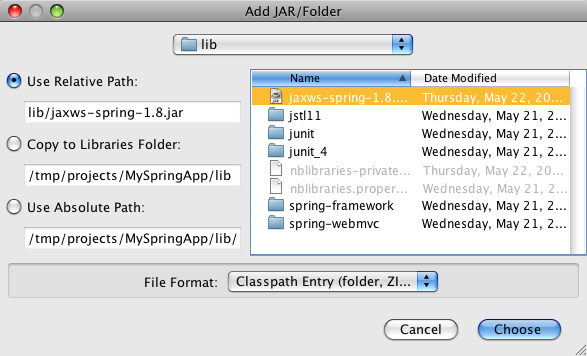 jaxws-spring-1.8.jar) into the lib directory of the NetBeans project. Next, right-click on the project in the NetBeans navigator and select Properties. In the Properties dialog, select the Libraries category and press the Add JAR/Folder button. Here you can select the library and add it to the project. The JAX-WS Spring library has a dependency on XBean. That means you need an additional library. You can download this version. Remember to add this library to the project as well. After you added an operation to the web service you could actually package and deploy our application to GlassFish and you would get a working Web Service because GlassFish recognizes the WebService annotation and automatically instantiates the Web Service. 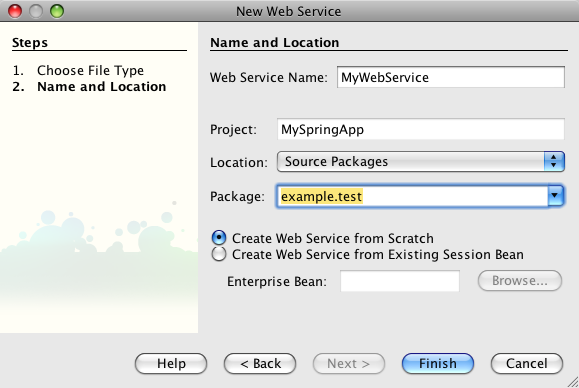 However, since this is a Spring tutorial, you need to go through a few additional steps to instantiate the Web Service as a Spring Bean. This section builds on Using Metro With Spring and NetBeans 6.1 or Using Metro With Spring and NetBeans 6.5 because the WSIT functionality is easiest to configure with NetBeans. But you should be able to apply the instructions when you are not using NetBeans as well. Once you have configured everything, you would simply build and deploy your application and Metro will pick up the configuration that was generated. If you need to create the configuration manually, create a file named wsit-package.service.xml and put it into the WEB-INF directory of your application. package.service needs to be replaced by the fully qualified name of the class that has the WebService annotation. If your class is named e.g. org.example.MyWebService, the file would need to be named wsit-org.example.MyWebService. 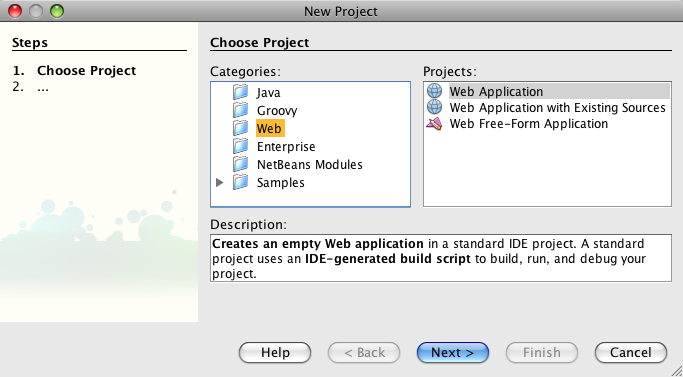 For more detailed instructions, see WSIT Example Using a Web Container Without NetBeans IDE.